RSPB have kindly agreed to let us re-post one of their blog entries of sightings here at Lake Vyrnwy back in the summer. We hope this gives you an idea of what wildlife you can expect to encounter here at Lake Vyrnwy, Wales. If you would like to keep up to date with their recent sightings then take a look at their blog. 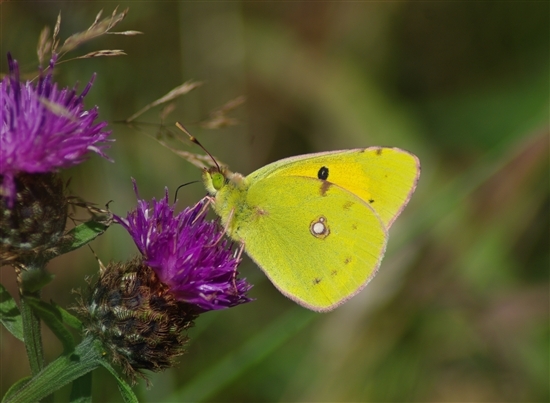 Highlight of the week was a superb Clouded Yellow butterfly seen flying around Llanwddyn (3rd), this migrant species arrives into the UK from southern Europe in variable numbers every year and is not a common sight in Montgomeryshire. In fact the whole week turned out to be rather good for butterflies with Purple Hairstreak spotted in the Hotel Wood and the weekly transect producing 57x Peacock, Small Tortoiseshell, Red Admiral, Small Skipper, Comma, Green-Viened White, Large White, Small White, Small Copper and Meadow Brown butterflies. Red Admiral butterfly was recorded in small numbers during the weekly butterfly transect. Earlier in the week we unveiled the following mystery photo on the RSPB Mid Wales Facebook Page. Well done to everyone who identified the mystery creature as a male Emerald Damselfly. This colourful damselfly is relatively frequent along waterbodies on the reserve at present. Other odonata sighted on the reserve this week included, Azure Damselfly, Black Darter, Common Hawker and Brown Hawker. Emerald Damselfly can be found frequently along the reserves waterbodies at present. High levels of bat activity were observed at dusk along the Afon Vyrnwy, with the bridge near the Sculpture Park (OS Grid: SJ020190) being a particular good spot to watch feeding Common Pipistrelle, Soprano Pipistrelle and Daubenton’s bat as well as listen to a family of Tawny Owls. The Afon Vyrnwy also played host to Kingfisher (daily), Dipper (daily) and Grey Wagtail (daily). Sightings on the lake included, 28x Canada Geese, 47x Mallard, 2x Teal, 9x Goosander, 1x Little Grebe, 3x Great Crested Grebe, 4x Cormorant, 5x Grey Heron and 2+ Common Sandpiper. We’ve been treated to some beautiful sunsets on the reserve recently. Other interesting avian sightings included, 1x Red Kite (regular over Llanwddyn), 1x Hobby (over Llanwddyn, 4th), 1x Goshawk (Red Trail, 4th) and Crossbill (regular, Visitor Centre, Orange, Red and Green Trails). Blue-bordered Carpet is top moth this week. Uncommon in Montgomeryshire this species inhabits damp woodland. Blue-bordered Carpet (Many Thanks to Gavin Chambers for the image). This entry was posted in RSPB, The Great Outdoors on February 3, 2016 by admin. Well done Ian & Jess! Ian our Food and Beverage Manager and Jess our Assistant Spa Manager recently took on the gruelling challenge of cycling from John O’Groats to Land’s End all in aid of Welsh Air Ambulance and Shropshire Cat Rescue. They started their journey on the 23rd of June and managed to cycle the 926(ish) miles to Lands End in ten days. This entry was posted in News, The Great Outdoors, Uncategorized on July 30, 2014 by admin. RSPB have kindly agreed to let us re-post their blog entry of recent sightings here at Lake Vyrnwy. If you would like to keep up to date with their recent sightings then take a look at their blog. Top sighting this week was a flyover Yellow Wagtail from the Red Trail (23rd), this summer migrant usually inhabits lowland agricultural fields with the nearest known local population located towards Welshpool. Another highlight this week was an Osprey which flew down the lake (23rd). The lake also played host to 30x Canada Geese, 30+ Mallard, 3x Teal, 3x Great Crested Grebe, 1x Cormorant and 4x Grey Heron. Frequent Kingfisher sightings this week included birds seen from the Lakeside Hide, below the dam and along the Afon Vyrnwy (Many Thanks to Gavin Chambers for this image taken at Vyrnwy last year). Other interesting bird sightings this week included, Red Kite (regular along the Dinas Mawddwy road), Sparrowhawk (regular at the Visitor Centre), Green Woodpecker (1x juvenile, Green Trail, 1x Abertridwr), Dipper (regular, Afon Vyrnwy), Wheatear (Bala Road), Stonechat(Rhiwargor waterfall), Spotted Flycatcher (family parties, LLanwddyn and Dinas Mawddwy road) and Crossbill (Visitor Centre, Red and Green trails). Siskin are regulars at the bird feeders at present (Many Thanks to Sam Constable for the image). The distinctive blooms of Harebell can be seen along the Green Trail at present. Purple Hairstreak butterfly should be searched for in the oak woodland at present with at least four sighted along the Green Trail this week (Many Thanks to Gavin Chambers for the image taken off site). The weekly butterfly transect highlighted a fresh emergence of Peacock’s, with twenty individuals counted alongside a single Comma and small numbers of Ringlet, Large White,Green-veined White, Small Tortoiseshell, Meadow Brown and Large Skipper. The blooms of Common Knapweed are providing a rich source of nectar for insects at present like this Skipper butterfly. Odonata on the wing this week included, Banded Demoiselle (first record this year), Emerald Damselfly, Black Darter, Common Hawker, Brown Hawker and Golden-ringed Dragonfly. Look how dark this male Black Darter is in comparison to last weeks female. This week’s top moth was also the focus of attention in the following mystery photo unveiled on the RSPB Mid Wales Facebook Page earlier in the week. I can now reveal that the giant moth in the photo is a Northern Eggar. Well done to everyone who guessed correctly. Eggar moths are an important part of the Vyrnwy food web with the hairy caterpillars being a favourite meal for Cuckoo and the flying adults a food source for acrobatic Hobby’s. Dayflying ginger male Eggar moths may be seen zigzagging across the higher level trails at present. Female Eggar moths were attracted to the light on our moth trap. This entry was posted in RSPB, The Great Outdoors on July 29, 2014 by admin.